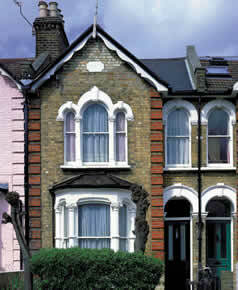 Like today, the windows played an essential role in designing a Victorian house. These windows were the central points in the houses and buildings. The window in any Victorian home was a rectangle in shape with its height remarkably taller than the width. There were variations in the types of windows used but the window sash was normally double- hung with six paned or eight paned sash which slides up and down to open or shut. At times, the windows were shortened because of the interior ceilings that had been lowered. 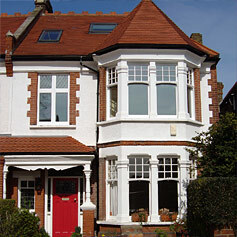 Windows were also shortened and widened with picture window sash fitted in the wider opening. The typical Victorian house includes Stained glass that was often used in windows. The designs of the windows varied from Greek to heavy French. Lace curtains were also used to ornate the windows and would be layered under the heavy drapes. The people who could not afford stained glass would use a transparent colored paper in the windows that gave the same effect as the stained glass. Generally, rooms having plenty of windows would be decorated in deep red, olive green and brown. The late Victorian transitional-style houses had less stained glass, though leaded windows with clear bevel edge panes began to appear. Bow window was a window style that first gained popularity in the 1800s in the Victorian houses. The bow window consists of three or four identical windows in one window frame. The box window is different from bay window. Bay style window is generally one non-opening picture window with opening windows on the side. The bow window also curves out from the side of the house and enables a great view and better light in the house than the traditional window style. They even have a seat of about ten inches. Another type of window seen throughout the span of the Victorian era is the sliding sash window. The earlier Victorian windows had six panes. Later on it changed to four panes vertical sliding sash windows with a single glazing bar down the middle. These were available from the 1870s.